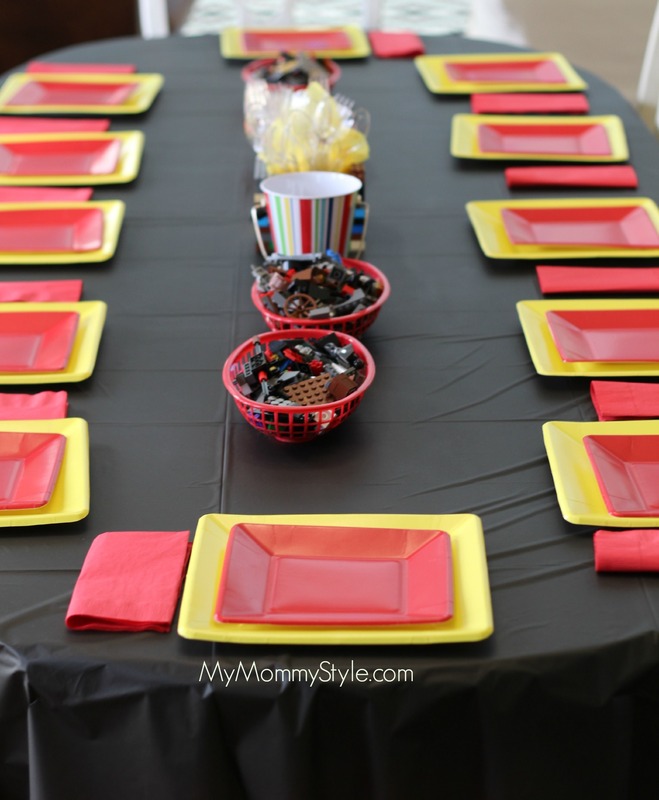 I had such a fun time designing this birthday party for Jackson. We were hoping that the Lego Movie would have come out by the time his birthday came around but it didn’t. We improvised and had such a great time! 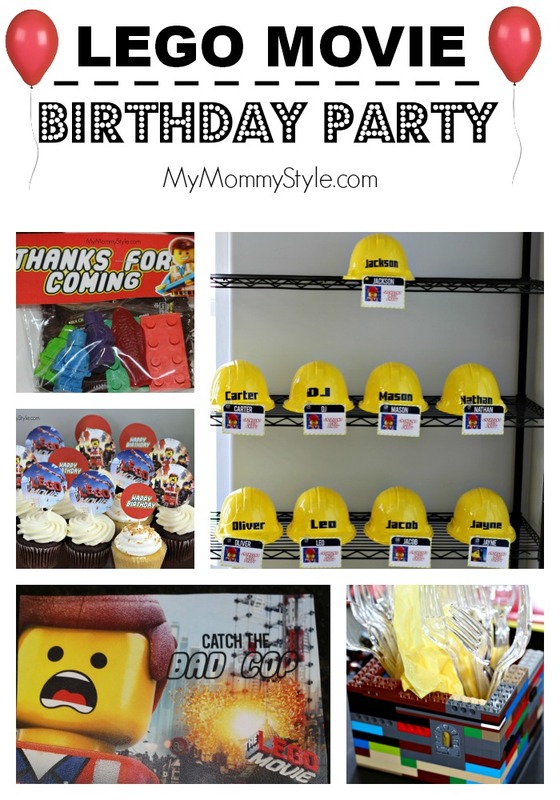 A HUGE thank you to Sara from Confetti Sunshine for helping me brainstorm and coming up with all of the printables too, you can find more of her birthday party ideas HERE. I think it is safe to say that I will be planning another Lego Birthday party in my life time as I now have two boys and it seems like every boy I know loves Legos. I wanted to make sure that I planned a party that is easy for you to repeat and doesn’t break the bank. Almost everything you see for this party came from the dollar store and that is no lie. I love to throw a party, but I also love to make it affordable. I found all of the paper products from the dollar store. I decided to go with mostly yellow and red as they are bright fun colors and look like the main colors of the LEGO brand. The little baskets were also found at the dollar store. I filled them with legos to be used as decorations for the table as well as to be used for a game to be played later. Jackson built this utensil holder out of his LEGOS with his Dad and it was a fun project for them to work on while I decorated the rest of the room. The small buckets in the middle of the table held these cards of “LEGO challenges” because in the LEGO Movie they are “Master Builders” I made all of the kids a challenge to be master builders themselves! Each card says something different like, “You have a band concert tonight but you can’t find your instrument. Can you build a replacement?” or “You were just made a ruler over your own country. Build your own mascot or flag.” With each creation the kids made I would give them an opportunity to tell us about what they had built. I made an industrial print of the LEGO Movie for $5 from Kinkos. You could also have the kids color it if you wanted it to be one of your activities. The boxes of LEGOS were made simply by wrapping them in different colors of wrapping paper I found at the dollar store. The little round parts were made from green bases you can buy to stick silk flowers in, you can also find at the dollar store. I cut the discs down into threes because they were too thick. (This also saved on how many I had to buy.) You cannot tell from this picture but I actually wrapped the whole table up in red so it looked like one of the LEGOS as well. Aren’t these cupcakes adorable?! I didn’t make them! Ha. But you can find the printables to make your cupcakes pretty here too with this printable. We wanted everyone to feel like a “Master Builder”, so I made these hats and name tags to have all of the kids “suit up in” as soon as they came through the door. You can find the name tags HERE. I had this rack downstairs in the basement that we use for storage and thought it would be a perfect place for them to pick up their badge and hat! We started the party by playing Lego Builder games with the challenges. I did this first because I knew they were fresh and not restless YET. ha ha. The kids loved making creations and after each challenge would share what they made with everyone. It was gorgeous outside and with 12 guests I wanted to utilize that. We played a game “Catch the Bad Cop” which was meant to go along with the movie and the bad guy portrayed throughout. Basically we played a game of freeze tag and the kids absolutely loved it. Our next activity was “Throwing the Ice Cream” to go along with the movie…although ice cream would be a little messy so we went with water balloons instead. I lined up some blue baskets from the dollar store and had the kids take turns seeing what balloon (ice cream ball) they could throw at a further and further distance before it popped. Time for cake and presents! Here are the thank you’s I put together for all of our guests. You can find the printables HERE and the directions on how to make your own LEGO crayons HERE. I hope you enjoyed our party! 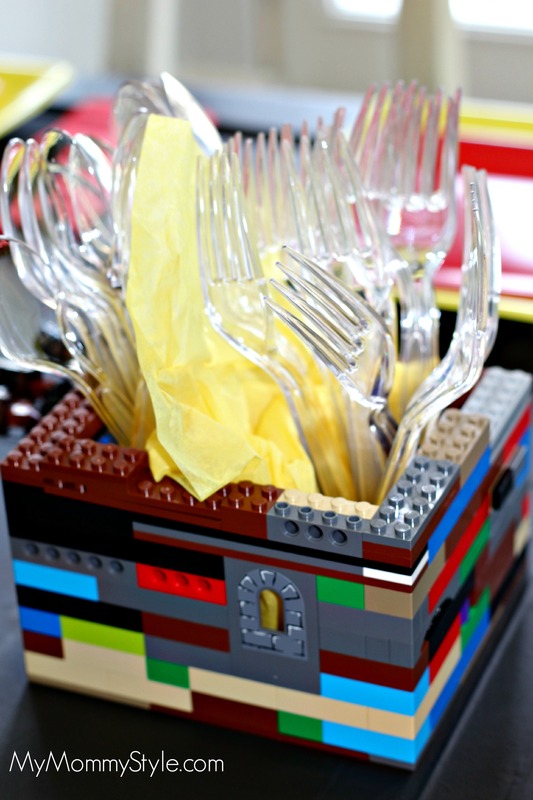 Looking for more easy LEGO party ideas? You can find them HERE! It’s hard to believe my baby is six years old. He just lost his first two teeth and when I lament about him growing up too quickly he promises me that I can kiss him every day, as much as I want, even until he is a Grandpa. I am pretty sure I am going to take him up on that offer. Nicole, I found the hats on Amazon. How did you get the names on the construction hats?